Bella does the majority of the incubation, but she does have to leave the nest to feed, in which case CR takes over. Here she is returning, and CR leaves the immediately so that she can take over again. On another occasion, he ignored her for 50 minutes before he gave in! 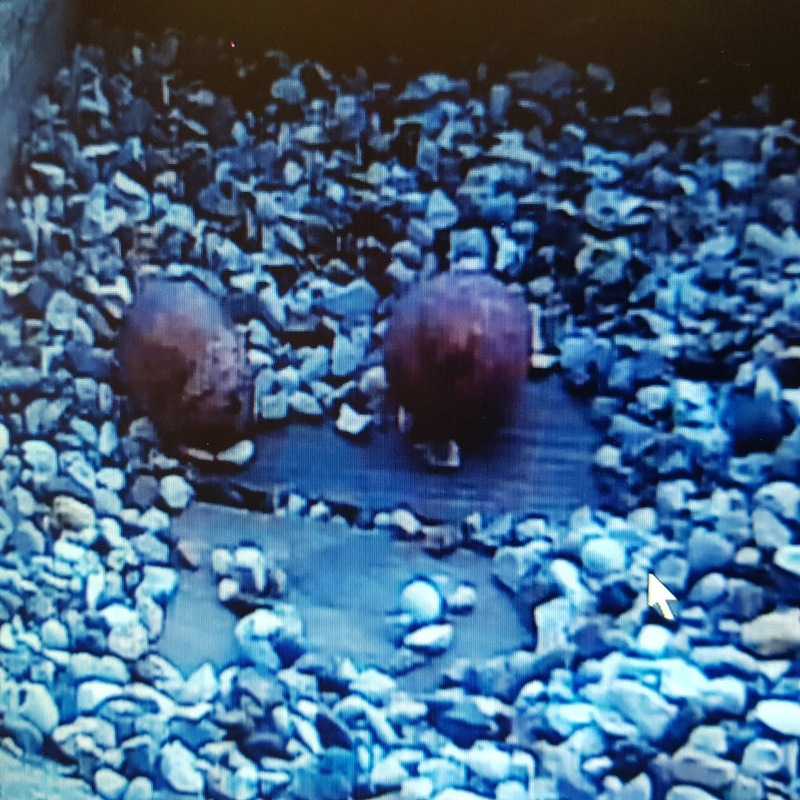 The third egg arrived sometime on Thursday night/Friday morning. Here is CR bringing some breakfast to Bella. 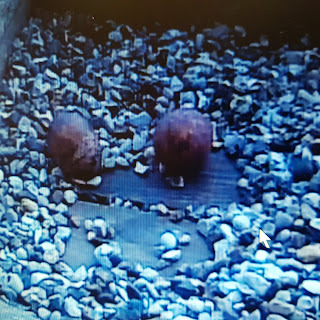 Just like last year, I've set up a live video feed so that anybody in the churchyard to the east of the Abbey can watch the activity on the peregrine nesting tray. While the birds are incubating, they are usually out of sight behind the edges of the nesting tray, so this is the only good way to see them. Here are the setup instructions which have been tested on an Android phone and an iPad. Hopefully they will work for you too! With an internet connection (eg at home), go to the Google Play store (Android) or the App Store (iPad). Search for and install the application called KViewPro. Now standing in the churchyard between the Abbey and the Gander Lane car park where you can see the nesting tray, search for and connect to the WiFi network called “Falcons”. The password is “peregrine”. Then select channel 1 and maximise the screen to get the best picture. Bells seems to want to do the lion's share of the incubating the two eggs so far laid, but she does let CR do some of it. Here they are changing over. The first egg was laid at about 16:00 on Sunday 7th April, but the camera didn't get a good enough look to know exactly when it happened. The second egg arrived in the early hours of Wednesday 10th. Here is the moment shortly afterwards when Bella carefully stepped away. Chances are that there will be another egg over the next few days. Bella has laid two eggs so far. The first one was on April 7th, the second on April 10th. There could well be a third over the next few days. It can't get more promising than this! Thanks to Dave Keen for this photo. It is usual for the males to bring prey to the females to prove they are able to provide for any offspring. Here is CR bringing something for Bella. What's not easy to see is that she rather clumsily grabs his leg instead of the food. That must have hurt! Bella was sitting on the west end of the Abbey today. There have been several more sightings recently. Bella is on the tower and CR flies around (sometimes quite fast) trying to impress her! This is usually accompanied by lots of noisy screeching. 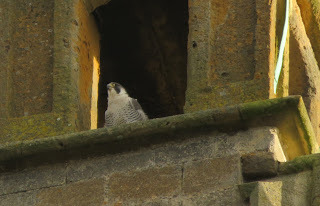 Here she is sitting on the NW corner of the tower. and here inside the NE pinnacle. I've never seen her sitting here before. Things are starting to look promising! 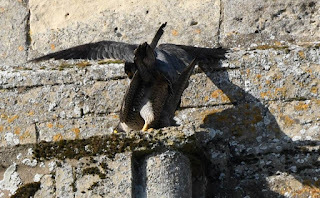 Peregrines are not the quietest of birds, and several people have commented to me that they have heard lots of squawking coming from the direction of the Abbey. I popped in tonight to see if I could hear or see anything. Only one (quiet) bird was visible right on top of the SE pinnacle, and from its size, I think that this is Bella. The other feedback I have had has been about the talk which took place on the 19th of January. There have been lots of positive comments which has been very nice to hear. The evening raised some £300 for Tewkesbury Abbey, and also nearly £100 for the Gloucestershire Raptor Monitoring Group. Very many thanks to all who supported this event. Chances are that it will be repeated in a couple of years time. 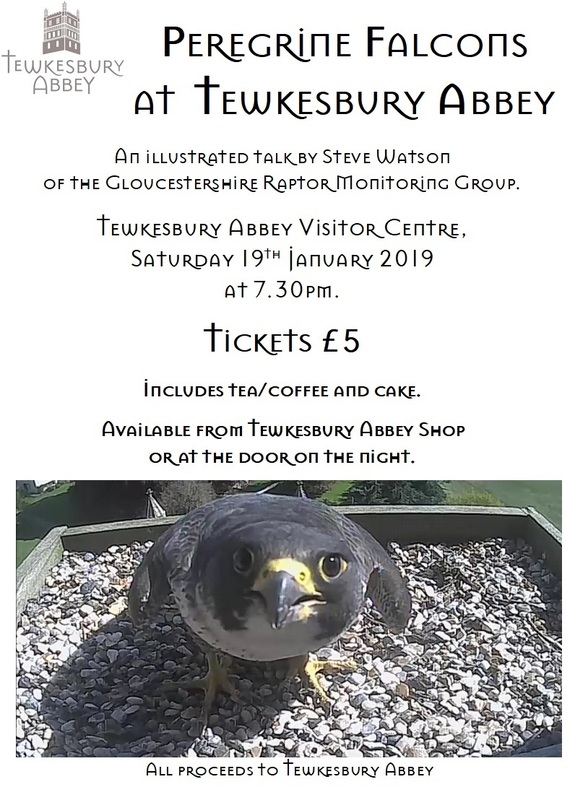 The Tewkesbury Civic Society have already booked me for their meeting on January 9th 2020 to talk about the Abbey's Peregrines. Hopefully there will be something about the 2019 season to talk about! I'm not exactly sure what's going on here, and the views from the other cameras don't make things much clearer. It looks like Paddington chases hid dad CR away, landing awkwardly on the tray. Then a few seconds later, mum Bella turns up and he flies off. There's lots of noise as well - a type of call I can't remember hearing before. Either way, it's really good to see that Paddington is alive and well and driving his parents up the wall! Since he fledged, getting any update on Paddington's progress has been difficult. I have often wondered if he's OK? Here is a somewhat rare visit to his birthplace as captured by the video camera. Firstly, Bella is seen on the tray, and then Paddington appears, but only for a short time as Bella then returns. 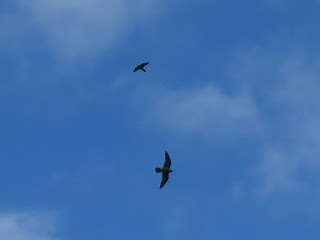 Paddington then flies off making lots of noise! I think it's safe to say that he is doing just fine. This is the moment Paddington flew off, only to have to be rescued! Paddington's had a very exciting day! 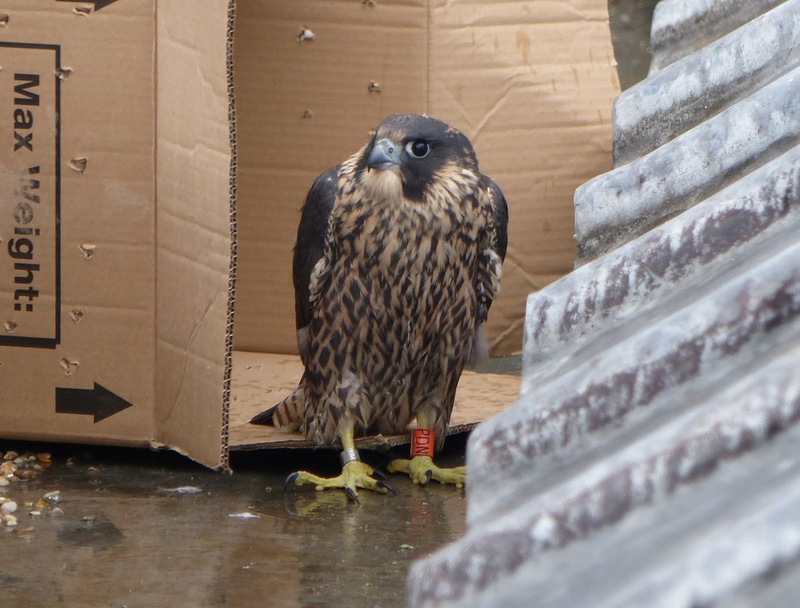 At 10:39 (this time has been confirmed from the video footage) this morning (Saturday 28th July), he flew off the tray. This was no accidental flight of fancy, but a deliberate and well planned flight. It didn't look like the first faltering flight, so maybe he has been off the tray before. I will go back over hours of video footage to check. Anyway, this flight didn't end too well, leaving him stranded on the ground nearby. Some very kind person (I don't yet know who) managed to catch him and took him to the Vale Wildlife Centre at Beckford. This is where the ringing system really works well, as within a few minutes, the Gloucester Raptor Monitoring Group received a call to say he had been rescued. The GRMG arranged to collect him and bring him back to his home at Tewkesbury Abbey. Having decided (the hard way - after climbing all the way up) that it was far too windy to let him out of his cardboard box in the top of the tower, we descended to a lower, safer, roof on the east side of the Abbey, just under his tray. 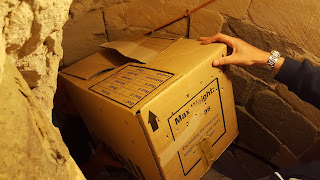 Here, the box was opened and we retreated. By the time we got down the tower, Paddington was sitting on the parapet none the worse for his day out.